Super Bowl hype has become almost formulaic over the years. In the weeks leading up to the actual game, many marketers release their TV spots in increments online for everyone to get an early look. Then there’s the game, which always has an exhilarating halftime show. The commercials are discussed ad nauseum for days afterward. It’s clear the formula is working. This year the Bowl didn’t break its own record, but still reached the 100 million viewer threshold. The only real variable is the game itself, which was another exciting finish featuring the extremely rare voluntary safety play. When the lights went out in the third quarter, we reached uncharted territory; the largest event of the year was put on hold due to a power outage, and the networks, players, fans in the stands and the viewing audience were scratching our heads. Some ads like Bud Light’s Lucky Chair were run again to fill the gap. Many took to social networks. My personal Twitter feed was full of jokes – the most common being Bane / The Dark Knight Rises references, Beyonce’s “second” performance, and crude Ray Lewis jokes – but the tweets that stood out the most were from brands. 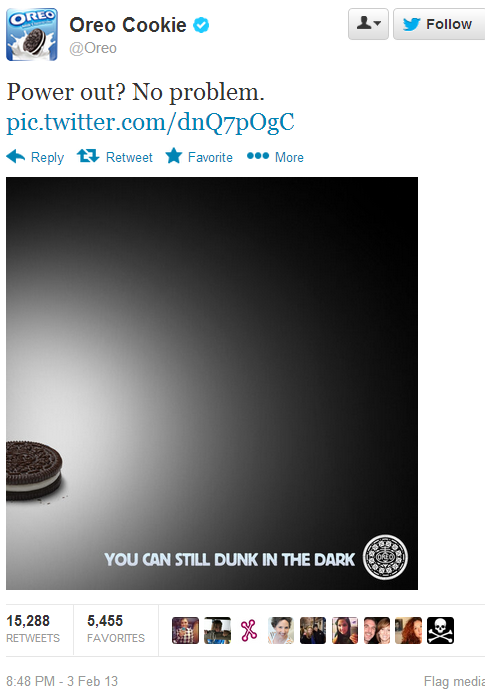 Oreo stole the show by following the brand’s “Whisper Fight” spot with a tweet that perfectly inserted their product into the immediate chaos of the blackout. Other kudos go to Audi, PBS, and Tide. I’ll even give credit to Calvin Klein, though that Vine was for a different target audience than the one I belong to, but I digress. While massive marketing events like the Super Bowl seem so planned out from every possible angle, the lesson learned – for PR professionals, advertisers, social media gurus, and others, is to always be ready to make the most of the unexpected and quickly adapt to the unknown. Of course, that is much easier said than done but these brands showed us it’s possible, and can help change brand perception with just 140 characters and a mouse click. Let the countdown for Super Bowl XLVIII begin. We hope MetLife Stadium in New Jersey can withstand the high power consumption that the Super Bowl demands. Posted on February 4, 2013, in DiGennaro Communications, Events, Social Media and tagged advertising, Black Out, Brand Bowl, Marketing, Oreo, social media, Super Bowl, Super Bowl XLVII. Bookmark the permalink. 1 Comment.